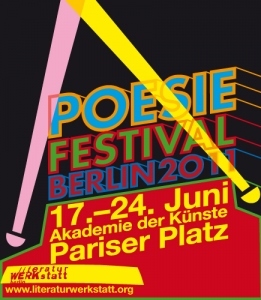 Just back from Berlin, where the Poetry Festival is continuing. The traditional World Poetry Night there is an amazing event I can’t imagine taking place in the UK – I wish I could. A huge audience assembles, each person with a paperback of German translations of the poems we’re to hear – and this year we each had dinky clip-on lights to enable the Maxim Gorki Theatre to be darkened. The poets read in German, Dutch, French, Korean, Arabic, English and Spanish, with a deft compère to keep the long night buoyant. And it was: clever shaping ensured that there were no longueurs – congratulations to Thomas Wohlfahrt, the Director, for pulling that off and for having the prescience to invite poets from the Arab world to bring their hopes and energies to the festival. Two highlights for me: the very modest presence of Silvio Rodriguez (I didn’t realise that he’s the most famous poet/folk-singer of Cuba), adored by the audience; and the virtuoso sound of Czech Iva Bittová, in her LBD and coral shoes, her voice and violin making Gertrude Stein’s words sound like a gypsy lament. The audience’s warm attention to all the poets was exemplary – a young audience in the main. On Saturday they were more vocal at the Arab spring session, where Deeb – the very engaging rapper from Cairo – got us shouting out to him at the end of an emotional evening. I was also at the annual meeting of poetry festival directors, along with Eleanor Livingstone from StAnza. It was sunny out on the Pariser Platz but there was a cold wind blowing through the room: a combination of the general economic crisis and the change to right-wing governments is bad news for the arts. Jelka told us that it had just been announced that the culture budget in Slovenia is likely to be cut by 80%; there was a letter from Bas Kwakman, director of Rotterdam’s Poetry International – which has been running for over 40 years – asking for support from each of us to protest against cuts of 50%. Yet everyone had plans to continue, and the Slovenians had found ingenious ways of bringing people and poems together, from writing lines of poetry on zebra crossings, to getting elderly women in a care home to embroider them on cushion covers. The Chileans from Casagrande proposed to extend their poetry bombardment project: converting Scottish rain into a rain of poems is a very appealing notion. Back to cooler Edinburgh, re-energised, with a new T-shirt courtesy of kind Dragana from Belgrade. It has a green leaf and a line from Branko Miljković on it: ‘promeni svoju pesmu/change your poem’. Echoes of Rilke and a motto for editors! « Poetry at the Edinburgh International Book Festival!